My front door is never without something pretty hanging from it. I call it my “welcoming committee.” 99% of the time it’s stuff I’ve thrown together from my basement…seriously! Today, I took down my Easter wreath thinking about what to replace it with. 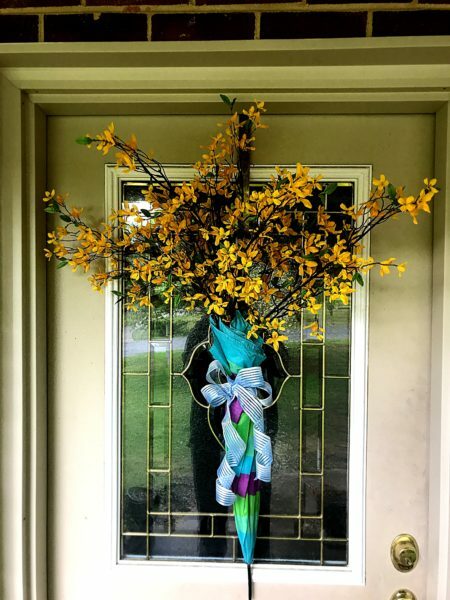 So in lieu of “Spring Showers Bring May Flowers;” an umbrella found at the Goodwill for $1 stuffed with 5-6 spring flower stems from a discount store & tied with a ribbon found in the $1 bin at the craft store makes a lovely $10 wreath…Voila!